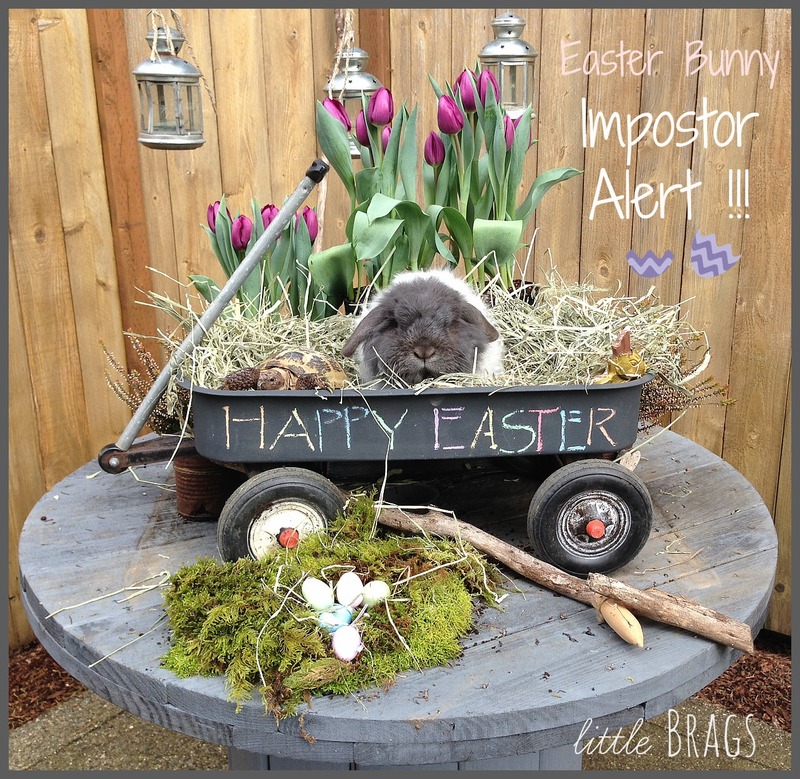 Can you spot the Easter Bunny Impostor? after the photo session was done. Old crates and buckets are always my favorite thing for outdoors! 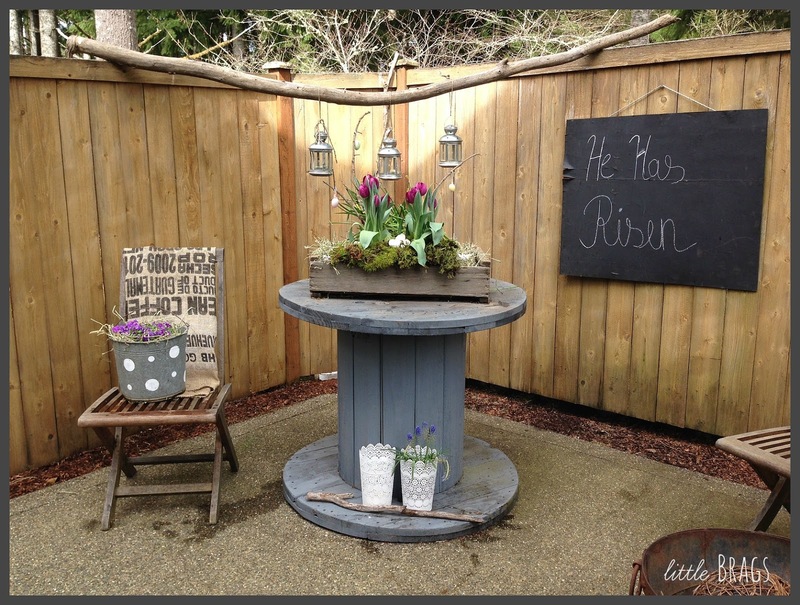 Thanks so much for stopping by and have a wonderful Easter celebration with your loved ones! I love your cute bunny photos, always bring a smile. 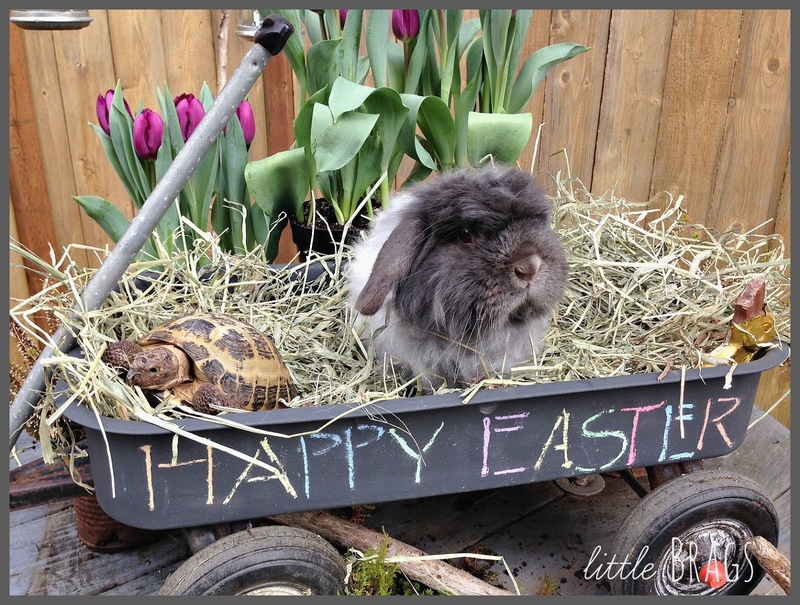 :) Love that chalkboard wagon, too, what a great prop! Such a cute bun bun & super cutee decor too! Happy Easter!!! Leuk is je wagentje geworden. Teehee! Bugsy and Willie are so cute! Happy Easter! Bugsy is so adorable. Happy Easter Christine to you and your family. Enjoy all the blessings the day brings today. This is the cutest! 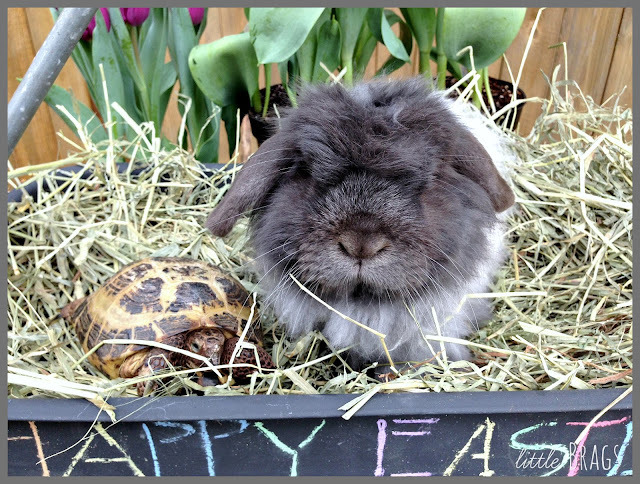 How did you get that bunny to pose for the photos? Happy Easter Christine! Adorable! Bugsy and Willie always make me smile. Just downright adorable! Most enjoyable Easter post this year! Thanks for the smiles. Too cute! 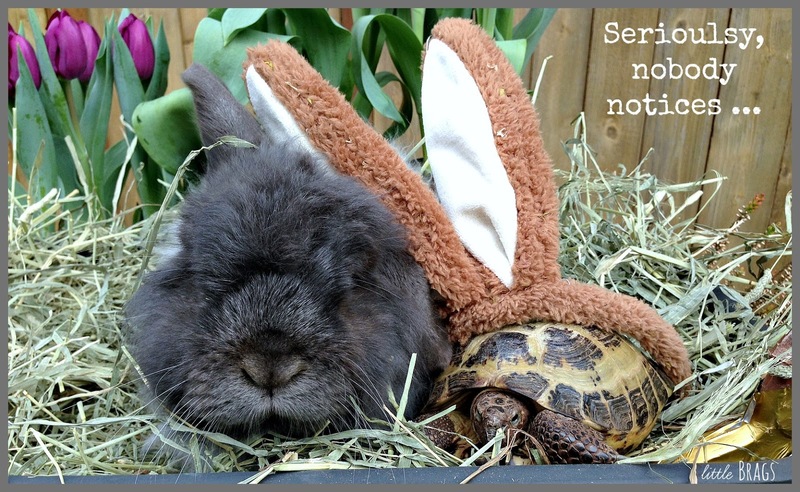 I don't know anyone who has a "tortoise and a hare" for pets except you. I love how they are pals. Love the cute photo of them in the wagon together. Who ate the ear off the bunny rabbit too? Bugsy and Willie are quite photogenic in their adorable Easter wagon. This is beautiful! 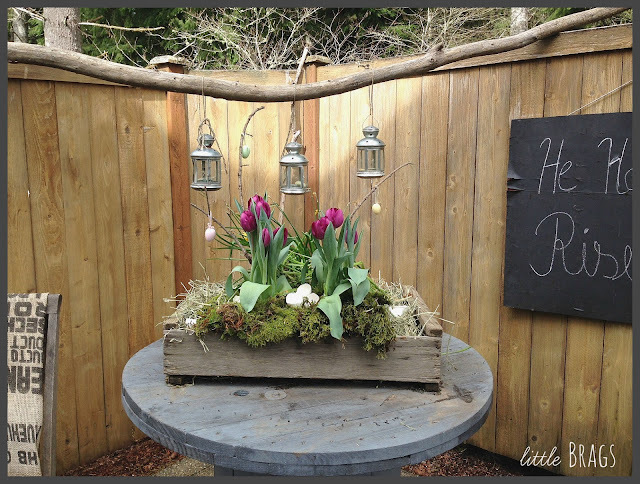 Thanks for linking up at the Spring Holiday Craftacular blog hop and linky party at Mom Home Guide! I love your bunny! Happy spring! They just get cuter and cuter! 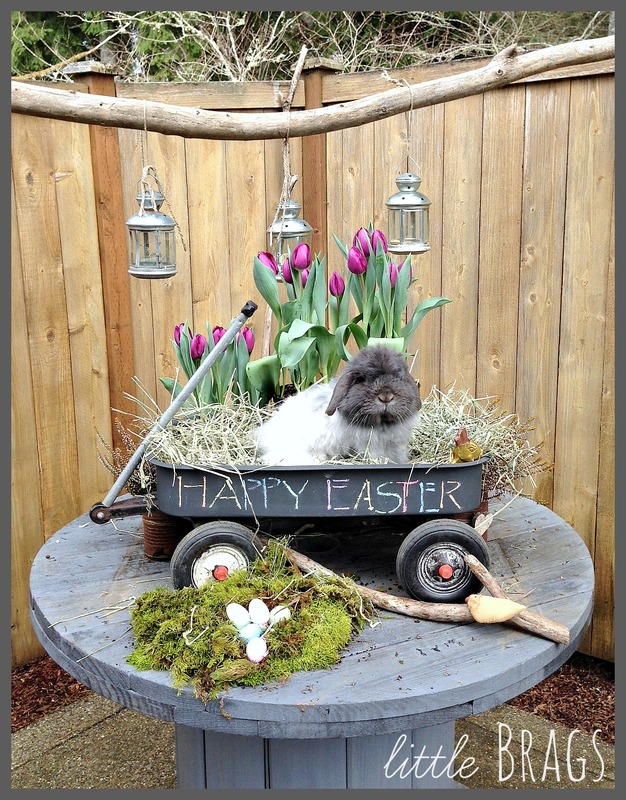 How do you get that bunny to pose so perfectly??? So adorable, and so is your entire vignette, plus the front entry that I have seen featured everywhere! Busy times, I am just now getting around to comments :) Hope your Easter was wonderful and Happy Spring Christine! I always like the way you set up your patio and your furry family is adorable! Oh, and your hard-backed one too!! Oh my how adorable Willie and Bugsy are. 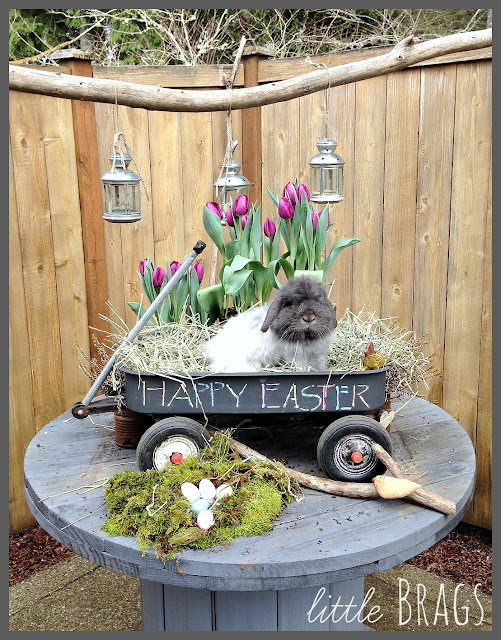 I love that Bugsy got into the Easter spirit with those ears! The wagon painted with the chalk paint is adorable, and can be styled for so many different holidays or special occasions! Thanks so much for sharing over at the Celebrate Your Story Link Party! I am pinning this one! I like your pail with the dots! 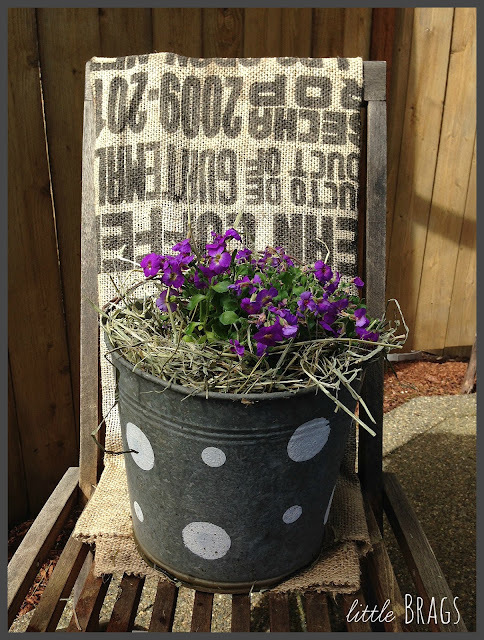 Did you paint the pail black first and then add the dots? 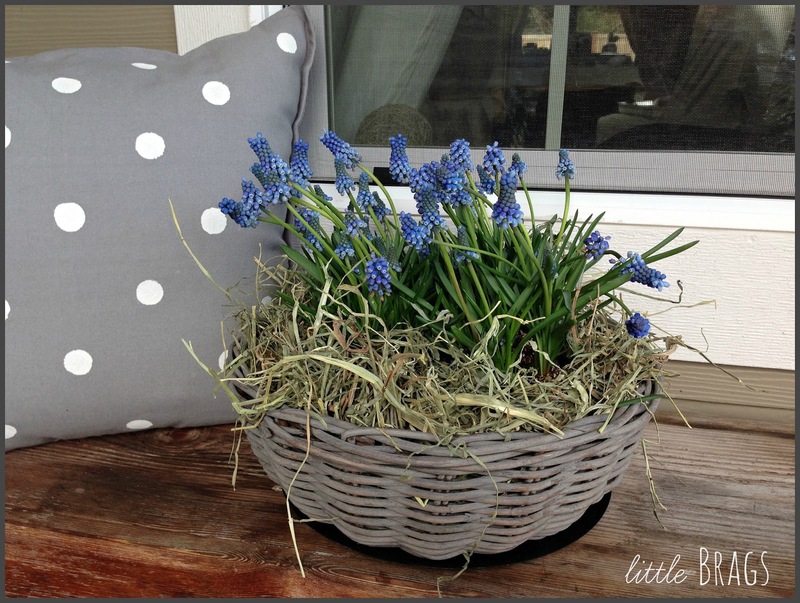 Love all your outdoor decor! 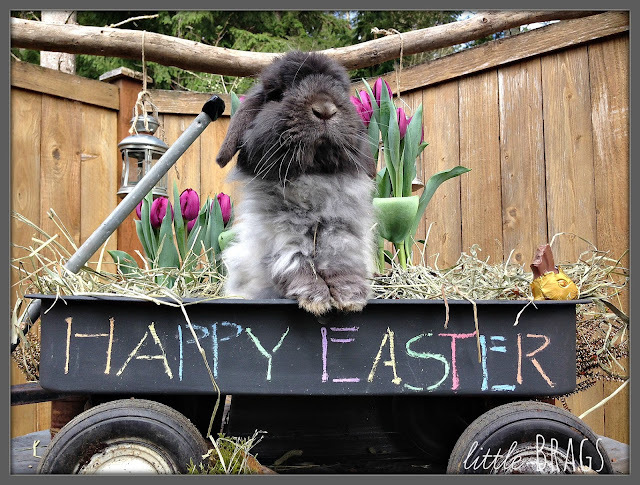 Your little bunny is adorable, and not camera shy. What a cozy retreat you have created! 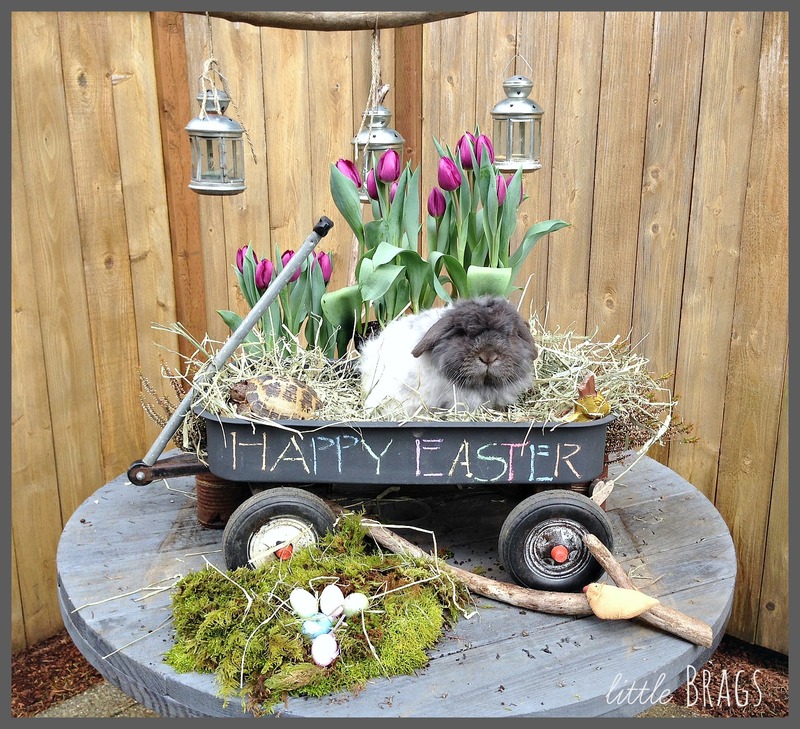 Bugsy is the cutest bunny around and he and Willie make a good team. I love your cute bunny and the wagon all decorated for Easter! I hope it was enjoyable for you! Thanks again for joining and sharing at our Cooking and Crafting with J & J! Oh my Goodness, I'm in love!!! Your bunnies are so darn cute, I can't take it! We have two bunnies as well, running around outside since it's always warm here... lots of bunny love here! Love all your deco!!! 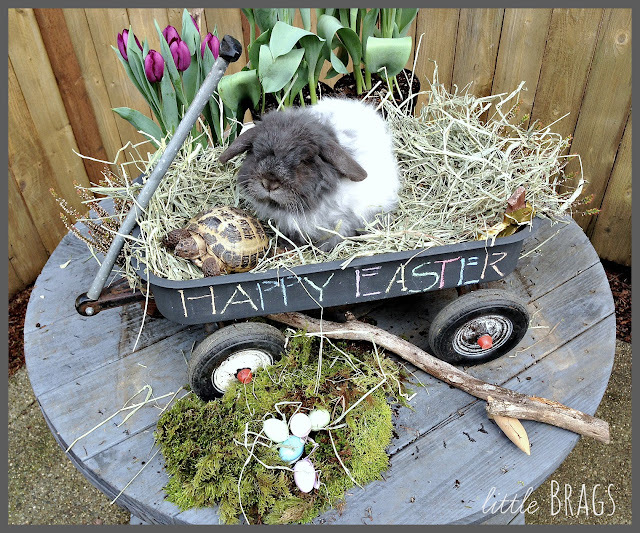 The bunny is adorable, and so is that wagon! So cute. Your bunnies are adorable.Thanks for sharing with us on Thursday Favorite Things. Oh Buggsy is so adorable, and Willie is cute, they seem to get along great, what fun pets. I am caring for a pigeon with a broken wing right now. This is so adorable! Busy and Willie are so cute together! Thanks for linking up with Merry Monday this week! That bunny is absolutely adorable, I had to see him AND his turtle buddy in their glory :) Thanks for sharing this, totally made my night! I really enjoy your eye for outdoor decorating. 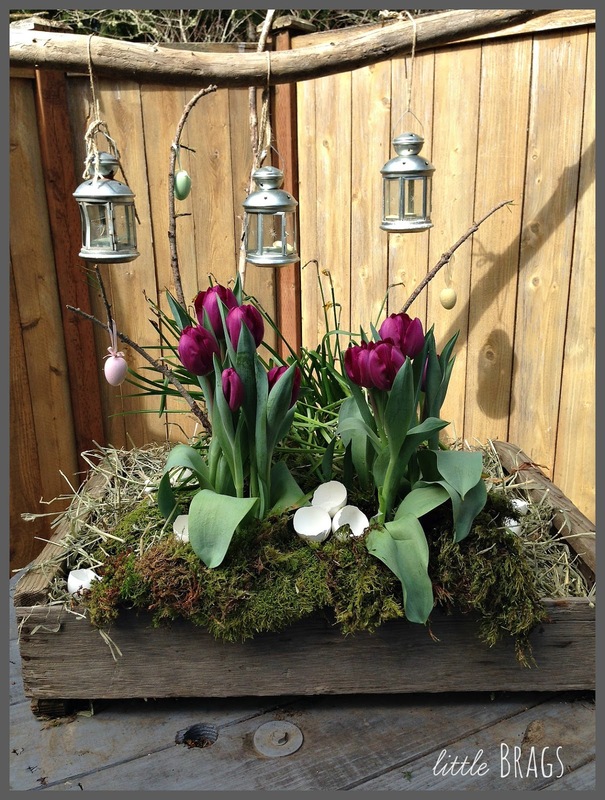 I need to incorporate more old crates and buckets into what I do. Thank you for sharing at the Celebrate Your Story Link Up Party. I have been looking for Bugsy for Easter!! Too cute! Thanks for sharing at HSH! This is so stinking cute!! I just want to jump through the screen and hug your little cutie pies as well as drool over your decor. Gorgeous! !